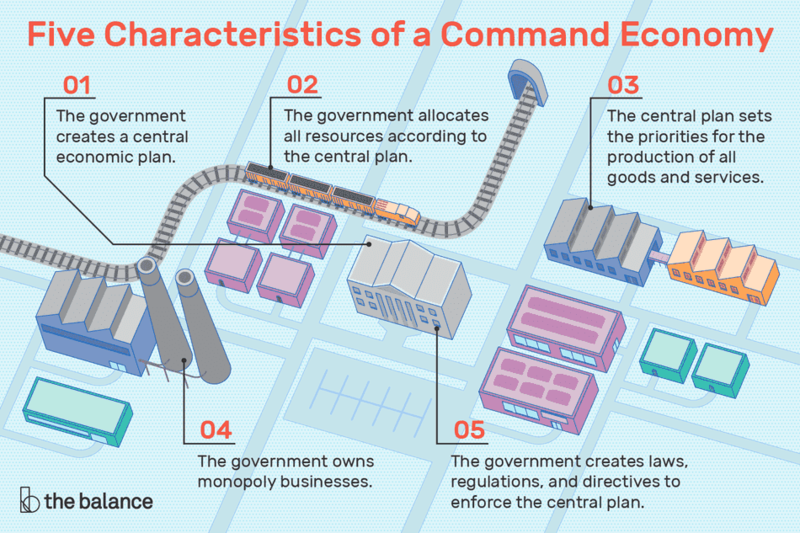 A command economy is where a central government makes all economic decisions. Either the government or a collective owns the land and the means of production. It doesn't rely on the laws of supply and demand that operate in a market economy. A command economy also ignores the customs that guide a traditional economy. In recent years, many centrally-planned economies began adding aspects of the market economy. The resultant mixed economy better achieves their goals. You can identify a modern centrally planned economy by the following five characteristics. The government creates a central economic plan. The five-year plan sets economic and societal goals for every sector and region of the country. Shorter-term plans convert the goals into actionable objectives. The government allocates all resources according to the central plan. It tries to use the nation's capital, labor and natural resources in the most efficient way possible. It promises to use each person's skills and abilities to their highest capacity. It seeks to eliminate unemployment. The central plan sets the priorities for the production of all goods and services. These include quotas and price controls. Its goal is to supply enough food, housing, and other basics to meet the needs of everyone in the country. It also sets national priorities. These include mobilizing for war or generating robust economic growth. The government owns monopoly businesses. These are in industries deemed essential to the goals of the economy. That usually includes finance, utilities, and automotive. There is no domestic competition in these sectors. A command economy has a few advantages, although they come with a few important disadvantages as well. Can manipulate large amounts of resources for large projects without lawsuits or environmental regulatory issues. An entire society can be transformed to conform to the government's vision, from nationalizing companies to placing workers in new jobs after a governmental skill assessment. Rapid change can completely ignore society's needs, forcing the development of a black market and other coping strategies. Goods production is not always matched to demand, and poor planning often leads to rationing. Innovation is discouraged and leaders are rewarded for following orders rather than taking risks. Planned economies can quickly mobilize economic resources on a large scale. They can execute massive projects, create industrial power, and meet social goals. They aren't slowed down by lawsuits from individuals or environmental impact statements. Command economies can wholly transform societies to conform to the government's vision. The new administration nationalizes private companies. Its previous owners attend "re-education" classes. Workers receive new jobs based on the government's assessment of their skills. This rapid mobilization often means command economies mow down other societal needs. For example, the government tells workers what jobs they must fulfill. It discourages them from moving. The goods it produces aren’t always based on consumer demand. But citizens find a way to fulfill their needs. They often develop a shadow economy or black market. It buys and sells the things the command economy isn't producing. Leaders' attempts to control this market weakens support for them. They often produce too much of one thing and not enough of another. It's difficult for the central planners to get up-to-date information about consumers' needs. Also, prices are set by the central plan. They no longer measure or control demand. Instead, rationing often becomes necessary. Command economies discourage innovation. They reward business leaders for following directives. This doesn’t allow for taking the risks required to create new solutions. Command economies struggle to produce the right exports at global market prices. It's challenging for central planners to meet the needs of the domestic market. Meeting the needs of international markets is even more complex. Belarus: This former Soviet satellite is still a command economy. The government owns 80 percent of the country's businesses and 75 percent of its banks. China: After World War II, Mao Tse Tung created a society ruled by Communism. He enforced a strictly planned economy. The current leaders are moving toward a market-based system. They continue to create five-year plans to outline economic goals and objectives. Cuba: Fidel Castro's 1959 revolution installed Communism and a planned economy. The Soviet Union subsidized Cuba’s economy until 1990. The government is slowly incorporating market reforms to spur growth. Iran: The government controls 60 percent of the economy through state-owned businesses. It uses price controls and subsidies to regulate the market. This created recessions, which it has ignored. Instead, it devoted resources to expanding its nuclear capability. The United Nations imposed sanctions, worsening its recessions. The economy improved once the nuclear trade deal ended sanctions in 2015. Libya: In 1969, Muammar Gaddafi created a command economy reliant upon oil revenues. Most Libyans work for the government. Gaddafi had been instituting reforms to create a market-based economy. But his 2011 assassination halted these plans. North Korea: After World War II, President Kim Il-sung created the world's most centrally-planned economy. It created food shortages, malnutrition and several bouts of mass starvation. Most state resources go into building up the military. Russia: In 1917, Vladimir Lenin created the first Communist command economy. The Russian people were ready for a radical change, having suffered starvation during World War I. Joseph Stalin built up military might and quickly rebuilt the economy after World War II. The Soviet State Planning Committee, or “Gosplan,” has been the most-studied command economy entity. The USSR was also the longest-running command economy, lasting from the 1930s until the late 1980s. Then, the state transferred ownership of the largest companies to oligarchs. In 2018, command economies like China, Russia and Iran have shifted towards more economic freedom, while North Korea and Cuba still remain economically repressed. Below you can see a world ranking countries by level of economic freedom, from the most free to the most repressed.